Members of the men’s lacrosse team were on a roll this fall raising money toward pediatric cancer research. Raising $20,475 (their original goal was $10,000) for the Vs. Cancer Foundation and Golisano Children’s Hospital in Syracuse put them in third place nationally. As a closer, lacrosse team members had their heads shaved in the Reid Athletic Center lobby during intermission at a home men’s hockey game, to help raise both awareness and money for the drive. As more data become available about the long-term dangers of sports-related head injuries, Colgate has implemented a strategy to minimize general contact as well as contact to the head experienced by student-athletes during practice sessions. The mandatory practice protocol covers all varsity athletics programs, with emphasis on sports where the risk is highest and injuries may be unavoidable — particularly basketball, football, ice hockey, lacrosse, and soccer. Research on the protocol began last summer as President Jeffrey Herbst and Director of Athletics Victoria M. Chun ’91, MA’94 sought to take a public stand on student-athletes’ well-being. The result is a unique collaboration among coaches, administrators, and athletic trainers. Chun and Colgate’s athletics trainer, Steve Chouinard, consulted with several coaches and medical professionals — including Dr. Merrill Miller, director of Colgate’s Student Health Services, who has served as team doctor for the past 30 years. Dr. Brian Rieger, who directs the Concussion Center of Upstate University Hospital in Syracuse, signed off on the plan. “We have a chance to be leaders here, inasmuch as you can prevent head trauma by practicing safely,” said Lee McConaughy Woodruff ’82, a Board of Trustees member. She and her husband, Bob Woodruff ’83, have dedicated their lives to creating awareness of the effects of traumatic brain injury, after Bob was nearly killed in 2006 by a roadside bomb while covering the war in Iraq for ABC News. The experience gave rise to the Bob Woodruff Foundation. 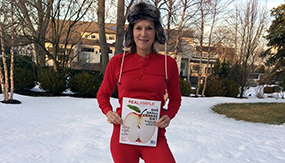 “As an alumna and advocate, I’m proud of Colgate for taking real steps, as well as a public stand, on this issue,” she said. The Women’s Rugby Club players were Excelsior Conference Champions. On the morning of Saturday, November 8, the sun rose to reveal the campus blanketed in a picturesque first snowfall. 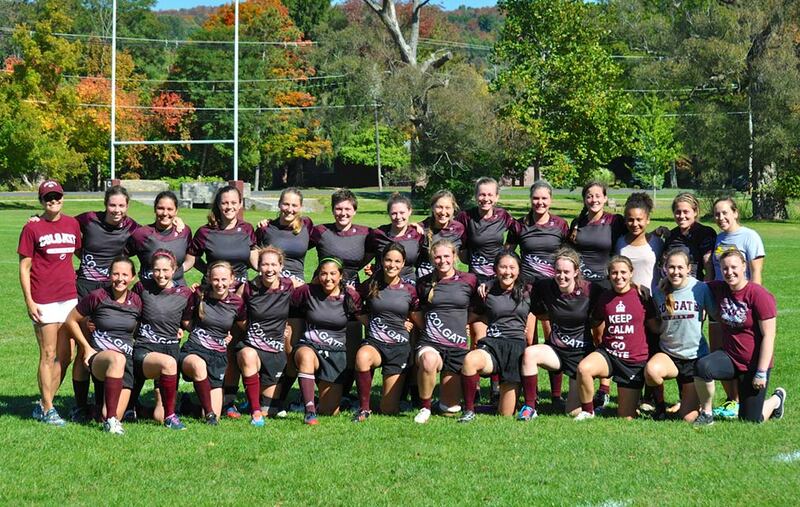 This beautiful scene meant work for the Women’s Rugby Club — we had to prepare for our first playoff match. After two hours of players, coaches, and fans shoveling off the field, we challenged the University of Vermont in a frostbite-inducing match — our first loss of the season (0-3). But all was not lost. We went 6-0 in the regular season and were Excelsior Conference Champions. It’s been 17 years since women’s rugby has had an undefeated season, and our group deserved the title. We supported each other both on and off the pitch — starting with an intense week-and-a-half preseason, followed by three of the hardest games back to back. “Everyone’s months of hard work paid off this season,” said captain Kira Yasuda ’15. For team bonding, before every match, we rented out an auditorium and watched a different inspirational sports movie to get pumped up. As for next season, “Our goal is to go to playoffs again and make it to the second round,” said Alex Maulden ’16, treasurer. 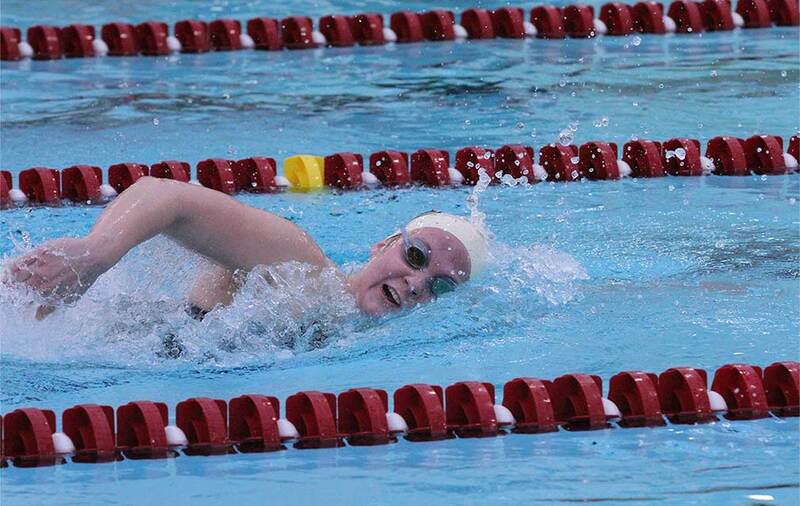 Morgan Cohara ’16 set two pool records, highlighting a record-breaking day for women’s swimming and diving during a dual meet at Canisius College’s Koessler Athletic Center. The Raiders scored a 167-129 victory and were still undefeated at press time. 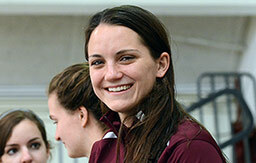 Cohara established new marks in the 1000 freestyle and 200 backstroke. Meanwhile, Lindsey Sagasta ’16 posted a new pool best in the 200 freestyle, and Flora Hanson ’17 turned in a new pool mark in the 200 backstroke. With the victory over the Golden Griffins, the squad improved to 5-0 on the season. Colgate’s NCAA Graduation Success Rate (GSR) is at 98 percent for the third-straight year, placing Raider student-athletes fourth nationally in Division I for the second year in a row. According to recently released data, Colgate was joined at that level by Stanford, Harvard, Yale, and Brown. 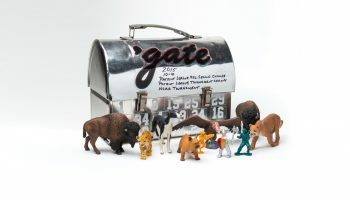 “It’s a testament of what we value at Colgate,” said athletics director Victoria M. Chun ’91, MA’94. 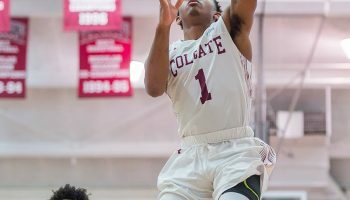 Colgate is one of just five Division I programs with 20 or more teams compiling a perfect GSR of 100 percent this year; the others are Dartmouth, Harvard, Notre Dame, and Stanford. Among Colgate’s Patriot League–sponsored teams, 17 recorded 100-percent graduation success rates, while Bucknell and Holy Cross each had 16. Director of Athletics Victoria M. Chun ’91, MA’94 has been named one of 40 members of the inaugural NCAA Division I Council. The council is charged with conducting the day-to-day business of Division I and will be the final voice on shared-governance rule-making. It was formed in response to the many changes taking place in Division I governance, and among its initial tasks is ensuring that the principles of amateurism are protected. Guidance on behalf of the collegiate experience of student-athletes has been a hallmark of Chun’s leadership. 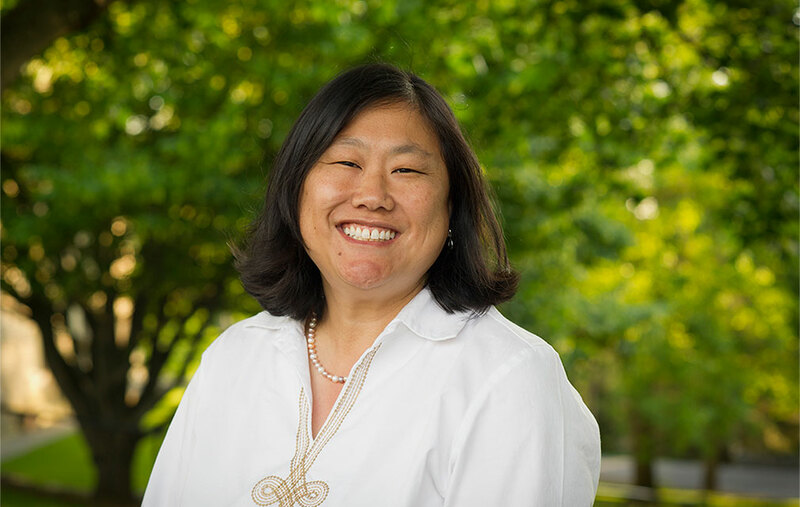 The only female athletics director in the Patriot League, Chun is one of 29 women among 345 Division I institutions and one of eight minority women actively leading an NCAA Division I athletics department. She serves on the NCAA Division I Championships Cabinet (liaison to FCS Football) and the NCAA FCS Football Regional Committee. She also serves on the executive board and chairs the foundation fund of the National Association of Collegiate Women Athletic Administrators. In 2013, she was selected to the National Association of Collegiate Director of Athletics John McLendon Minority Scholarship Foundation Board. Most recently, Harvard University invited Chun to serve on its Board of Overseers. Women’s soccer senior captain Caroline Brawner was one of 10 finalists for the Senior CLASS Award. Although Brawner didn’t ultimately win the award, it was an accomplishment for her to be a finalist, chosen by a media committee and then voted on by fans. To be eligible for the award, a student-athlete must be classified as an NCAA Division I senior and have notable achievements in four areas of excellence — community, classroom, character, and competition. 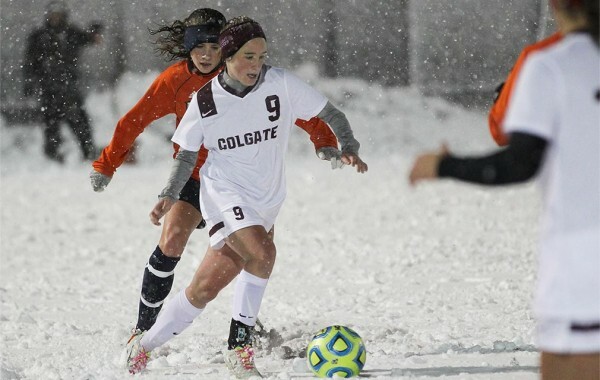 At press time, in her senior year, Brawner had led the Raiders to a 13-game unbeaten streak, an RPI ranking of 23, the top spot in the NCAA Division I Women’s Mid-Atlantic Poll for four straight weeks, while also helping Colgate receive national votes for five consecutive weeks. The two-year captain is a two-time All-Mid Atlantic Region Honoree, and three-time All-Patriot League Recipient, while being named to the All-Academic Patriot League team twice. She has compiled 18 multipoint games, while notching 17 goals, 15 assists, and 49 points so far in her career. A four-year letter winner, she sits tied for 16th all-time in career assists. The Edmonds, Wash., native also excels in the classroom, majoring in international relations with a 3.53 cumulative grade-point average. Along with making the All-Academic Patriot League Team twice, Brawner has been named to Colgate’s Academic Honor Roll for three years. Leo Stouros ’16 capped a terrific summer of indoor lacrosse in his native Canada by helping the Six Nation Arrows to the 2014 Minto Cup championship. The Minto Cup has crowned Canada’s top junior team since 1937. Stouros, who is entering his junior campaign for the Raiders in 2015, was selected by InsideLacrosse.com as one of the Minto Cup’s top defenders. Stouros and the Arrows came back to defeat the Coquitlam Adanacs four games to two after dropping the first two games of the championship series. A native of Kitchener, Ontario, Stouros played in all 16 games, with 15 starts last season for Colgate. He compiled 19 ground balls and caused 10 turnovers. He also was a member of the Patriot League Academic Honor Roll and Colgate’s Raider Academic Honor Roll. Goaltender Charlie Finn ’17, who helped get the Raiders off to their best start since the 2004–05 season, was named the Hockey Commissioners’ Association (HCA) National Division I Player of the Month for October. The 5’11”, 165-pound netminder from North Vancouver, British Columbia, was named the HCA Player of the Month for the first time in his career. He registered six wins in seven contests in October (6-1-0 overall mark), which was tops in the nation, allowing just eight goals while recording a nation-best three shutouts. Finn began the month with a 33-save effort in a 3-1 victory at then No. 6/7 St. Cloud State on October 10. The performance marked the ninth time in his career that he recorded 30 or more saves in a contest. He also stopped all 75 shots faced in three home contests at Starr Rink in October, blanking Northeastern twice and Mercyhurst once, while allowing more than two goals in a single game on just one occasion. In addition, Finn picked up a pair of road victories in a weekend sweep at Sacred Heart, which helped the Raiders to a No. 4/4 national ranking. Logging 417:16 minutes in net, Finn finished October with a 1.15 goals-against average and a .952 save percentage mark, as he turned away 152 of 160 shots faced. Finn was tabbed ECAC Hockey Goaltender of the Week and NCAA.com First Star of the Week for his two-shutout performance against Northeastern. 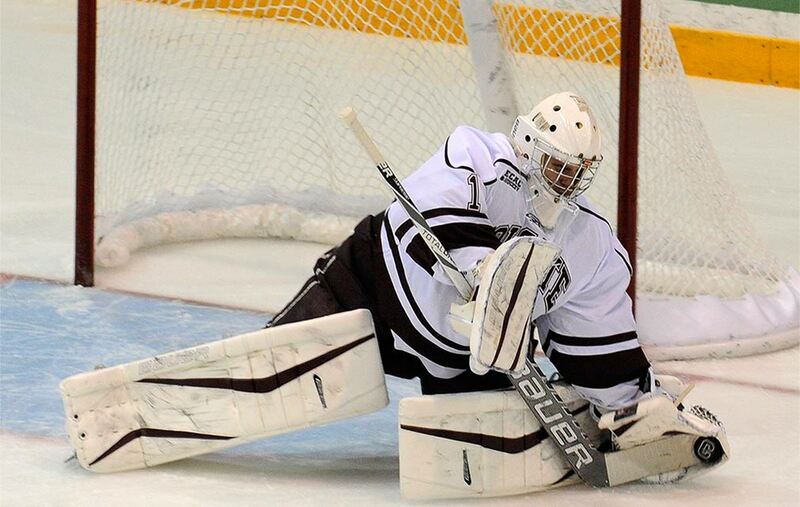 In addition, he was voted as ECAC Hockey Goaltender for the Month in October. Colgate finished an impressive 13th during the College Colors Day annual competition in which fans wear their team colors and share their school spirit on social media. 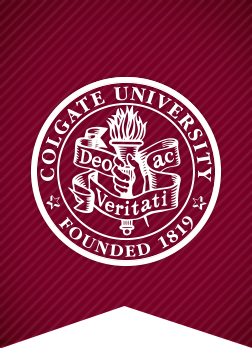 Colgate not only was the top Patriot League school with 7,720 points, but also eclipsed more than 125 competitors, including Arizona, Florida State, Virginia, and Florida. 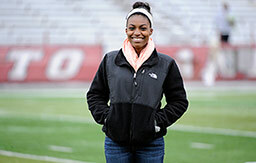 For those efforts, the Collegiate Licensing Co. made a donation to Colgate’s general scholarship fund. 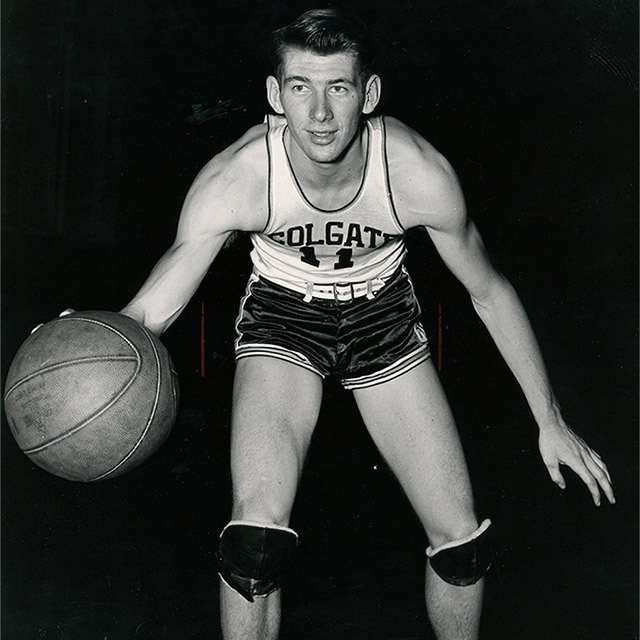 Ernie Vandeweghe ’49, one of the Mount Rushmore figures of Colgate athletics and the school’s first All-America basketball player, died on November 8. He was 86. Vandeweghe was named to All-America squads in 1947, 1948, and 1949. Named MVP of the 1946 East-West All-Star Game at Madison Square Garden as a first-year, he played in the same classic again in 1949. His 19.4-point scoring clip in 1946–47 ranked third in all of college basketball. The 6’3″ Vandeweghe was the fifth-best scorer in the nation for two seasons. The modern emphasis on offense and 3-point shooting caused his records to be surpassed, but the Long Island native remains in the school’s top 21 for all three of his season averages. He stands seventh in career scoring average, ninth in points. Vandeweghe was named to Colliers magazine All-America first team, Sporting News first team, Look magazine second team, Associated Press and United Press third teams — and every All-East team selected. In addition, CBS Television designated him one of the 10 best basketball players in the country. Colgate retired Vandeweghe’s No. 11 jersey on Ernie Vandeweghe Day, March 8, 1953, in Madison Square Garden. Today, his banner hangs in Huntington Gym, Colgate’s home court during his era; and in Cotterell Court, current home of the Raiders. The Colgate Athletics Hall of Honor inducted him in 1980. “His No. 11 that hangs in the rafters at Cotterell Court will always remind us of how much one person can accomplish, all while being a great family man and giving back to others in the community,” said men’s basketball head coach Matt Langel. 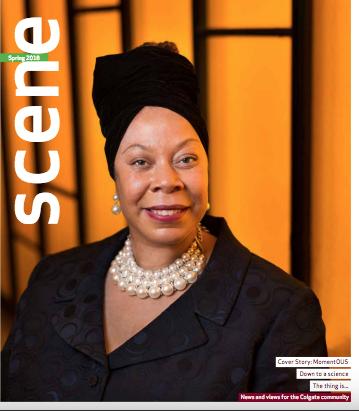 Vandeweghe was a pre-med student and member of Maroon Key and Konosioni, president of the Pan-Hellenic Council, and a George W. Cobb Fellow. Following graduation, he spent six seasons with the NBA’s New York Knicks. He scored 2,135 points in 224 regular-season games while attending Columbia University Medical School. After retiring from basketball, he became a physician for the U.S. Air Force in Germany. Vandeweghe then went on to serve as team physician for the Los Angeles Lakers from 1960 to ’67. He later became a sports agent; basketball legends Bill Walton and Spencer Haywood were among his clients. Highly respected in the athletics world, he served as chair of the President’s Council on Physical Fitness and Sports, and with the Olympic Sports Commission under President Ford. In the 1970s, he assisted on two key pieces of Olympic sports legislation: Title IX and the Amateur Sports Act of 1978. With his wife, Colleen Kay Hutchins (Miss America 1952; died 2010), Vandeweghe had quite the sporting family. Son Kiki was a college basketball and NBA star and head coach; daughter Tauna won a U.S. national swimming championship and competed in the 1976 Summer Olympics; son Bruk medaled in beach volleyball at the 1994 Goodwill Games; and daughter Heather captained the U.S. national women’s water polo team before becoming a physician like her father. Granddaughter CoCo Vandeweghe is a professional tennis player who has competed in all four Grand Slam tournaments. 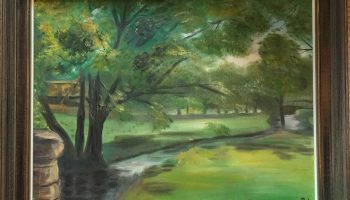 Born Sept. 12, 1928, in Montreal, Vandeweghe grew up in the Long Island hamlet of Oceanside, N.Y. He also played soccer at Colgate and was invited to the 1948 U.S. Olympic Trials in that sport. His father, Ernie Sr. ’26, was called “one of the best soccer players in Colgate history” and played professionally. I work here at Colgate, as a custodian in East Hall. I’m going on my 30th year working at Colgate. 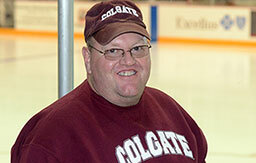 What’s your favorite thing about watching Colgate hockey? Two of the guys who live in my dorm — East Hall — are on the team, and I’ve been following them for years. They’re great kids — we’ve had them over to the house for dinner, and they’re really good to the family. What’s the craziest thing you’ve seen at a Colgate sporting event? Back in the ’80s, in the championship game, one of the players started taking his clothes off, and threw his jersey into the stands. Why did you come to the game today? I used to play volleyball in high school. What’s your favorite thing about watching volleyball? I think it’s an exciting sport, and I like to support other athletes because I swim here. 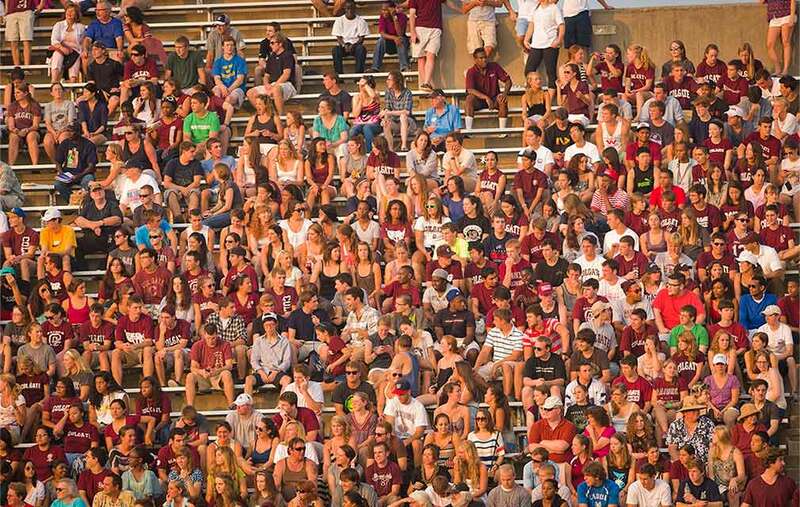 As a student-athlete, what do you think makes a good fan? Someone who’s loud and encouraging. It’s the last home game, and it’s Senior Day for a lot of my friends. I used to be a three-sport varsity athlete. I played soccer, basketball, and lacrosse, and tennis for a year or two, but soccer was always my big sport. Is there a lesson you’ve learned from watching sports? Never give up hope! Colgate football is a really big second-half team, so if you leave in the first half when we’re losing by a touchdown or two, it’s too bad because something fun always happens in the second half.